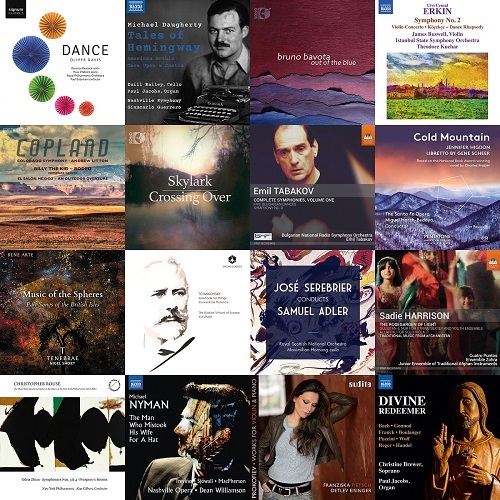 We know that the sheer size of Naxos Music Library can feel a little overwhelming, and that with so many amazing new releases joining the database it can be easy to miss out on an album that would have become a favorite. Even those of us on staff, who spend our weeks in the site, can find it hard to keep up with every new title. Nevertheless, we have found quite a few favorite releases over the course of 2016, and we would like to share them with you. This is of course no exhaustive list of what we've loved, but these were the albums we found ourselves returning to time and time again. Some of these will be Grammy nominees, or critical favorites you'll see on many year-end lists. Others will be those hidden gems we dug up ourselves and really want you to hear and love as much as we do. Either way, we encourage you to not let these slip by unconsidered. We've created a playlist of some of the highlights of these favorite albums, which you can find by clicking the appropriate banner in NML. If you are within your institution's wifi network, you might also be able to go directly to the playlist by clicking HERE. Full albums can be reached by clicking one of that album's tracks in the playlist, or by copying and pasting any of the catalog IDs below into the keyword search in NML. We know that 2016 has been a weird year for most of us, but it has not been short on excellent music. Enjoy! So grateful for all the support NML have given my third release, Dance. Couldn't have done it without the talent of Paul Bateman, Kerenza Peacock, Huw Watkins and of course, The Royal Philharmonic Orchestra. Especially grateful to amazing designer Rebecca Manley who's front cover designs have drawn so many new listeners towards these releases.